The leakage current clamp F65 is an advanced type of the F62 leakage current clamp. The leakage current clamp F65 has been completed through a RMS measurement. The leakage current clamp owns all functions of a multimeter. Main functions are: Leakage current measurements, measurements of current and voltage up to 600 V, continuity and resistance measurements. 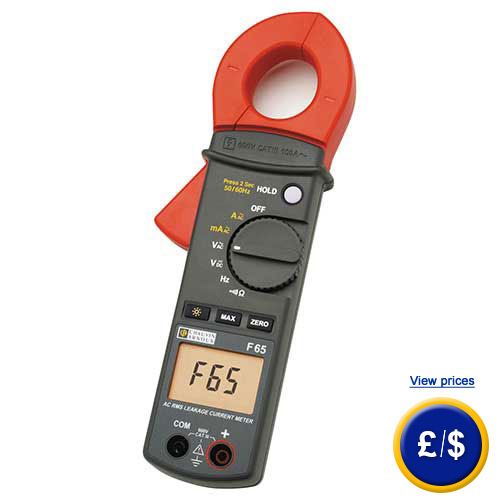 This leakage current clamp has a comparative measurement which compares two values. The clamp can be opened in a diameter of 28mm. Through activation the harmonic filter on the clamp meter all frequencies above 50 Hz will be stored. If there are any questions about the leakage current clamp F65 have a look at the technical specification below or call: UK customers +44(0) 23 809 870 30 / US customers +1-410-387-7703. Our technicians and engineers will gladly advise you in all clamp meters and all products in the field of measuring instruments, regulation and control and scales.